Like it or not — shorts season is here my friends. Being from the south-ish (is Texas even considered south?It’s south alright but is it southern? Discuss. ) I was born wearing shorts. True story; modern day miracle. But when it becomes consistently warm enough that I find myself reaching shorts every day, it always takes me by surprise. It’s the complete opposite of sweater season, but equally just as exciting. I’m always a fan of denim cut-offs, but I’ve picked up a few tailored shorts for the season. 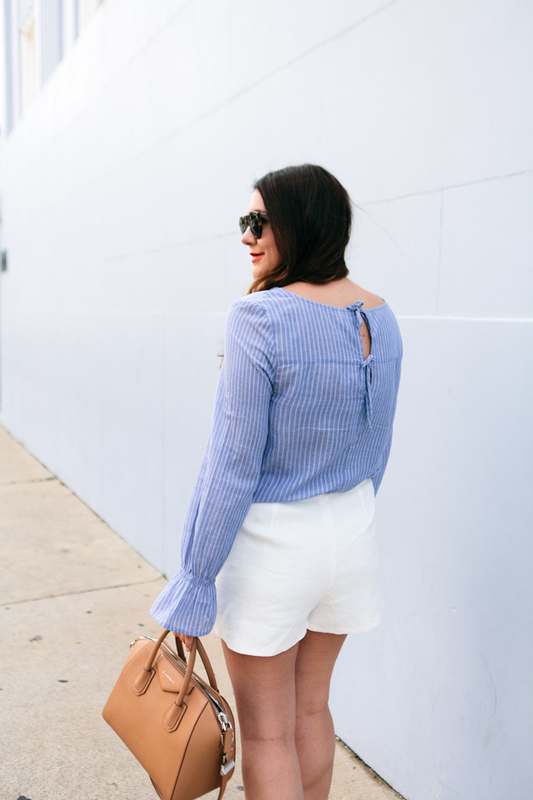 Starting with this white linen-ish high waist short (more like a lightweight linen, therefore linen-ish), I had high hopes for this pair of shorts and they do not disappoint. I like that they come in a few different colors as well. 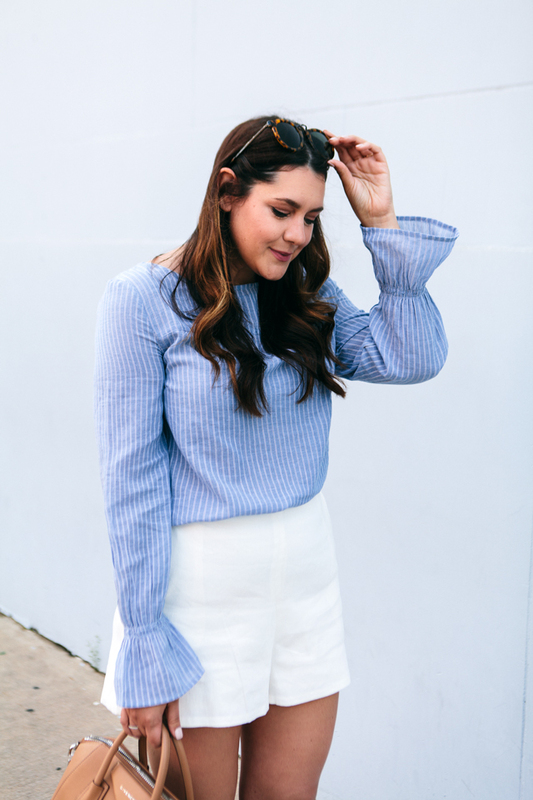 But white was the color for me — I never feel like you can go wrong with white in the spring and summer. You can find this pair of shorts here! 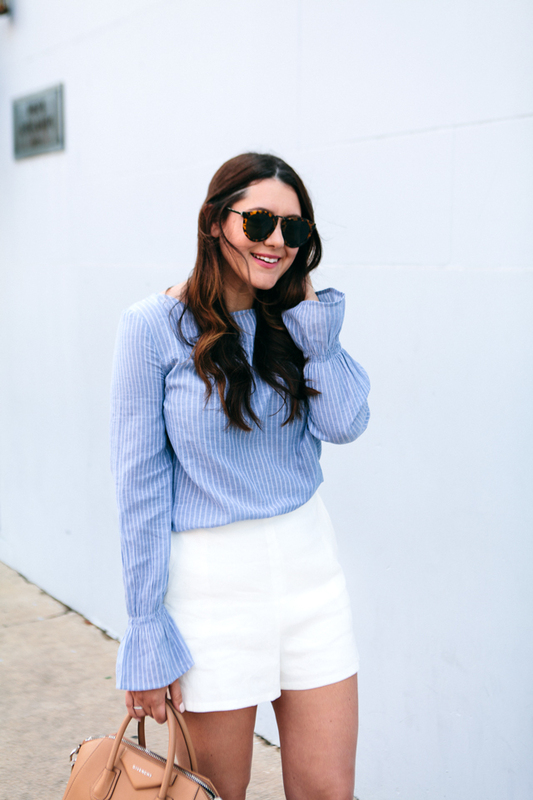 Here are a few of my favorite tailored shorts for the season! This top is adorable coming and going. 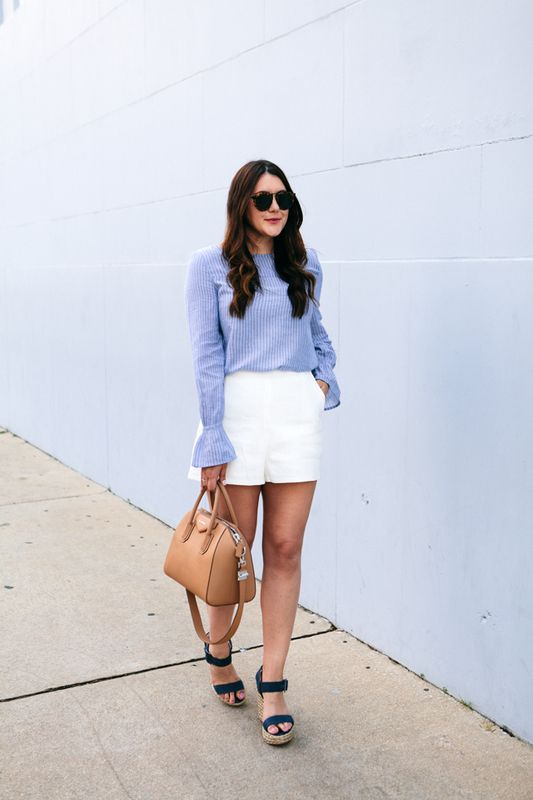 Bell sleeves in the front, bows in the back. I love that you can easily pair it with denim as well. You can find this top here! Since they are white, I know you’re wondering if they are see through. You can see the form of the pockets, but not my underwear. I was wearing a light pair just in case, but they didn’t show in the photos or IRL, as confirmed by Bryan. Fits true to size with a little bit of room. The top fits true to size, as well. I love the bell sleeves with the shorts, the proportions work so well. I’m excited J.Crew brought back the high waisted bow shorts from last year. I hope they also bring back the eyelet crop top they had. What a cute outfit! The shorts are so chic. 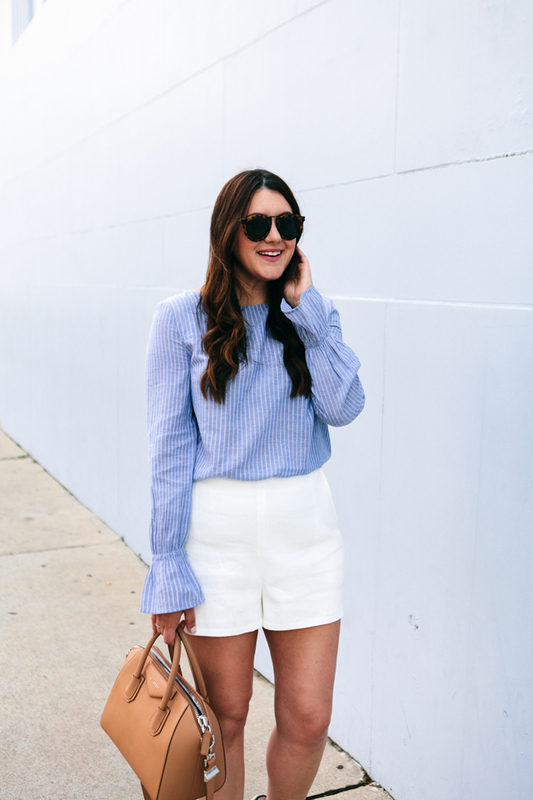 I agree – white shorts are the best during Summer! 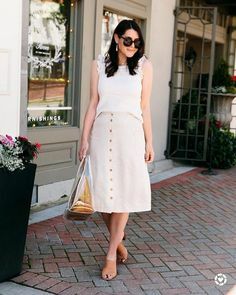 A nice and cool but also elegant outfit! 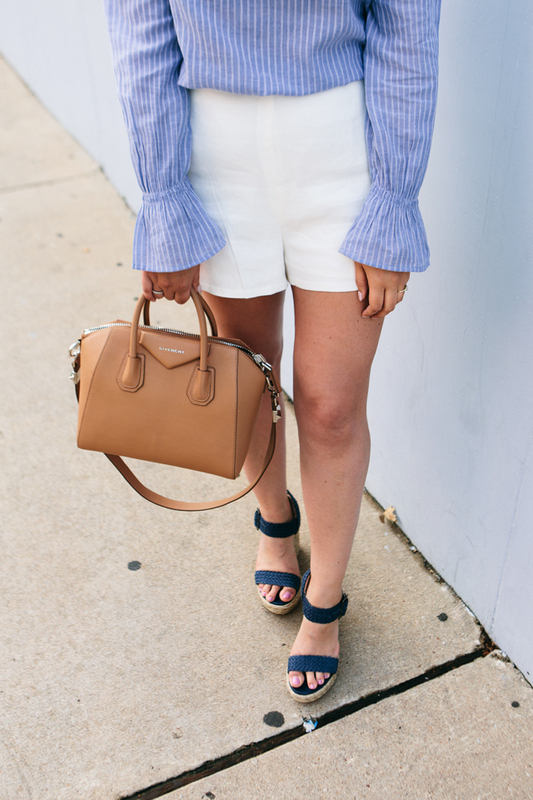 Perfect short and great striped top! You are looking so lovely and summery here! I’m loving your top beauty! Those white shorts are so cute! I love that they’re high waisted!